(Boulder City Parks and Recreation Department) Pickleball players, from left, Kathy VanNoordt, Steve VanNoordt, Don Wolf, Joe Johnson, Ken Hanaki and Steve Smith thanks the city league's new sponsor, Boulder Dam Credit Union. Pickleball popularity is growing in Boulder City, according to Kelly Lehr, sports coordinator for Boulder City Parks and Recreation Department. Local players meet in the new gymnasium at the Parks and Recreation Department, 900 Arizona St., from 9 a.m. to noon weekdays and from 1-3 p.m. most Saturdays. If the gym is being used for special events or department programming, players will meet at the gymnasium and outdoor pickleball courts at ABC Park. If the gymnasium is unavailable, players will meet at The ABC park gymnasium and outdoor Pickleball courts. On any given day, 10-20 retirees will meet to challenge each other, Lehr said, adding there are three inside courts in the new gym. 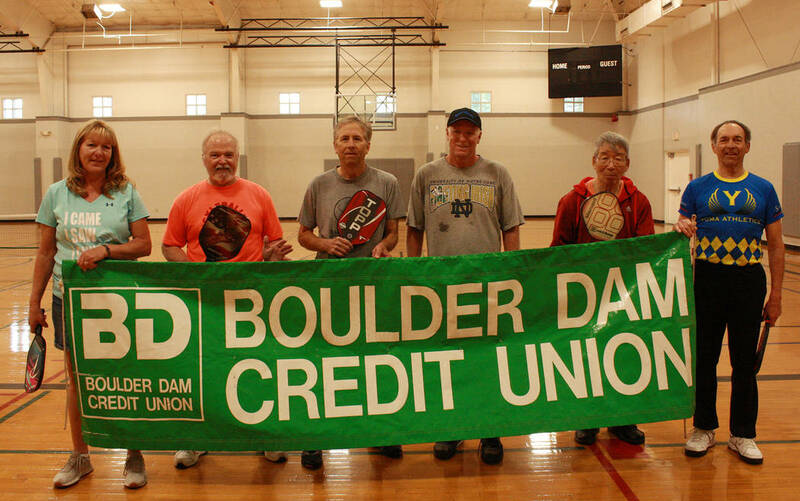 The local pickleball club is being sponsored by Boulder Dam Credit Union. Existing players welcome any residents who play or those that are interested in learning to play. For more information, call the recreation department at 702-293-9256.